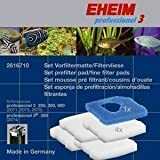 For the professional 3 250, 300 and 600 filters. This entry was posted in Aquatics and tagged 2616710, 3/250/350/600, Eheim, Filter, Media by One Boutique. Bookmark the permalink.